If you’re looking for a great deal on a new or reconditioned Toyota forklift and you’re located in any Central or Southern Illinois county, you’re in luck. We serve most of Central IL from our St. Joseph base, including Marshall, Mount Carmel, Decatur, Champaign, Danville and other nearby areas. 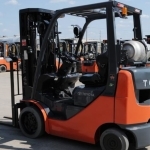 Whether you’re looking for a light-duty 2,000 lb capacity electric forklift for your small warehouse or a heavy lifter with a 17,500 lb carrying capacity, you can find it at Bahrns ToyotaLift - Central Illinois. What if you know you need a forklift, but aren’t sure what’s the best forklift for you? Our customer service representatives have decades of experience helping customers with their every materials handling need. All you have to do is ask and they’ll be happy to help you. Do you need Toyota Forklift quality, but want to save money on your forklift purchase? Bahrns ToyotaLift - Central Illinois can help you. We are an authorized Toyota Certified Reconditioned Forklifts dealer, too. Toyota authorizes only the best service technicians to put forklifts through a rigorous 103 point inspection process and recondition them to make sure they are in perfect working order with an unparalleled warranty to back them up. Serving all of Central Illinois, including Iroquois, Ford, Champaign, Vermilion, Piatt, Macon, Douglas and Edgar Counties, Bahrns ToyotaLift - Central Illinois truly is “Toyota Central” for Central IL and beyond. Our Toyota Sales Consultants are available for you to talk to during normal working hours to answer all your questions or give you an obligation-free quote. Just give us a call or, if you’re in the neighborhood, stop in and have a look around. We’re open Monday-Friday from 8:00am to 5:00pm. For additional online resources be sure to compare the different forklift options on Toyota comparison page. This is where you can compare Toyota Models side-by-side. 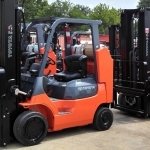 Bahrns ToyotaLift of Central Illinois is the region’s leading full-service forklift dealer. We supply the latest and greatest models of Toyota Forklifts available for purchase. From Lightweight Class II Narrow Aisle forklifts, Class III Walkie/Walkie Riders to heavy-duty Class IV and V industrial forklifts that are rough and tough enough to handle even the biggest jobs, you can find them here. Along with new machines we have used and reconditioned forklifts, rental forklifts, forklift parts and accessories. Our service department offers valuable certified forklift operator safety training and experienced service technicians for your forklift service needs. If it has to do with forklifts, you can always find what you are looking for at the region’s best forklift dealer, Bahrns ToyotaLift of Central Illinois. For nearly half a century, Bahrns Equipment and Bahrns ToyotaLift - Central Illinois have been Central Illinois’ most trusted name in materials handling equipment and supplies. 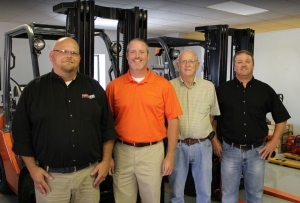 Since establishing their original Bahrns ToyotaLift facility in Effingham, Illinois in 1981, Bahrns has become known as “Toyota Forklift Central” in Central Illinois. The Bahrns story begins in Effingham, IL, where they opened Bahrns Equipment in 1966. Building their reputation on a foundation of quality, service and value, the Bahrns name spread and in 1992, the company expanded their operations in a new 25,000 square foot supplies facility in Effingham. Even this was not enough to keep up with demand, though, and it became apparent that Bahrns customers wanted to get all their materials handling equipment from one trusted source. 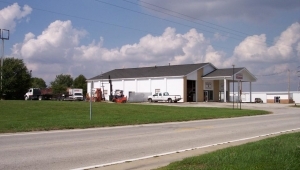 That customer demand led to the opening of Bahrns ToyotaLift - Central Illinois Location in Champaign in 1999 and a subsequent move to improved facilities in St Joseph, IL a few years later. Today, St Joseph, IL is the proud home of Bahrns ToyotaLift - Central Illinois and the customers are served by Bahrns’ Effingham ToyotaLift facility. Not only does Bahrns ToyotaLift of Central Illinois' supply new, used, and rental forklifts, we also provide the very best products and equipment within the industry. We offer a large selection material handling vehicles, packaging and shipping supplies, work carts, dollies, stretch film, poly or steel banding and everything else you need for your dock, warehouse, office, or other business operation. With the biggest selection, the most popular brands, and the friendliest and most helpful customer service in the region, why go anywhere else than Bahrns ToyotaLift of Central Illinois, your industrial equipment dealer. Whether it be procedures or equipment inside the facility or operator training or pedestrian traffic, with any business safety comes first. Bahrns ToyotaLift of Central Illinois is a supplier of safety equipment from guardrails, rack protection, propane or battery protection to operator training, safety DVD's, literature and posters. A safe working environment is a successful business and we're here as your safety equipment supplier to assist you with maintaining that success injury and accident free. When preparing to ship items is part of your business's daily tasks, whether it be equipment packaging or wrapping a pallet, Bahrns ToyotaLift of Central Illinois has the packaging machinery and supplies to keep your business moving forward. The most dependable industrial, warehouse and material handling equipment is what Bahrns ToyotaLift has to offer. From stretch or shrink wrap dispensers and pallet wrap machines, banding carts and tools to scissor lifts, aerial lifts, powered or manual pallet jacks and new Toyota Forklifts, reconditioned or used forklifts, Bahrns ToyotaLift of Central Illinois is here as your equipment supplier. Bahrns ToyotaLift offers repair service for may areas of material handling equipment. 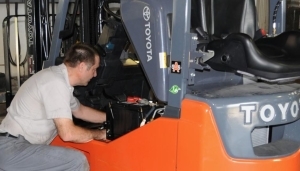 Our forklift repair service consists of certified Toyota Forklift technicians with the experience and expertise to resolve mechanical issues with the new, reconditioned or used forklift you may have for your workplace. Bahrns ToyotaLift's Repair Service prides itself on finding and resolving technical and mechanical issues on material handling equipment you may have. Bahrns ToyotaLift of Central Illinois also offers machine maintenance for material handling and packaging equipment. When equipment and machinery are constantly in use, all it takes is one piece of machinery breaking down to cause a major bottleneck in production. Preventative machine maintenance helps keep every business's workflow productive, up to par and on pace. Scissor lifts, aerial lifts and many other types of equipment are also readily available as part of our equipment rental agency fleet at Bahrns ToyotaLift. Needing a piece of equipment for a temporary solution for your business? Call us at Bahrns ToyotaLift of Central Illinois and inquire with our helpful customer service representatives today. Not ready to buy, but still needing a Toyota forklift for your business's current workload? Bahrns ToyotaLift of Central Illinois has the region’s biggest and most dependable forklift rental service. 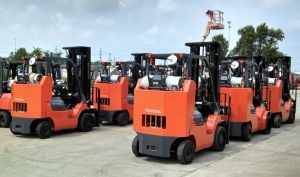 Whether you need a single forklift for the day or a multiple vehicles for the whole year, you can find the same top-quality, hard-working, and durable Toyota forklifts for rent or lease as you can for sale. Our friendly expert rental professionals can provide you with the vehicle or vehicles you require when you need them. Just one call can take care of all your forklift rental needs at Bahrns ToyotaLift of Central Illinois. Wants and needs are spoken of all the time. As your business grows you'll need solutions for the increased production. An answer for one or all of those solutions could be a forklift. Of course you like the idea of a new forklift, but the ever important growth of business is yet to carry over to your budget . Maybe the budget tells you that a new forklift may be achievable, but you also may be in need of some other equipment updates and there lies the dilemma. Not all used forklifts are represented by the rusty and sometime broken down units you pass by on the daily commute. Purchasing a used forklift from a forklift dealership with certified mechanics on staff are affordable and assures you of a dependable forklift for the tasks needed while saving your budget for needed equipment in other areas of the business.